Since our start in 1973, High Quality Landscape Services has been providing beautiful landscapes and exceptional services to some of the areas finest homes. Our trained, experienced and dedicated teams are focused on serving the demands of the most discerning homeowners in Dallas and the North Texas region. We have satisfied customers that we have proudly served for decades. Customer stay with us because our comprehensive approach and commitment to quality service sets the standard in residential lawncare. High Quality Landscape Services is a full-service landscaping company that can meet all of your needs. Starting with your vision and inspiration, we will develop a landscape design that you will enjoy and be proud of for many years to come. We will provide the finest plants and materials to implement your vision, and our experienced team will provide you with exceptional service during the installation. In additional to traditional landscaping, we also offer our customers beautiful hardscaping and stonework services. We are also a full-service landscape maintenance service provider, meticulously maintaining your beautiful outdoor space. We perform regular mowing and trimming of your lawn, shrubs and trees, as well as irrigation, fertilization, weed control and pest control services. 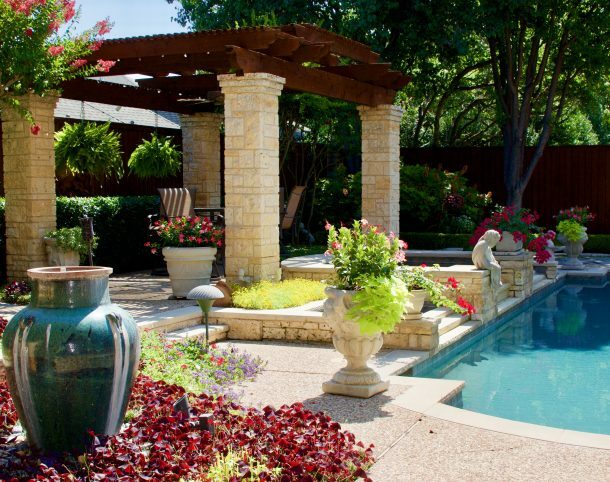 We are dedicated to creating beautiful landscapes and providing you with exceptional service. Call on us today to experience the High Quality advantage. Transform your beautiful landscape into an inviting outdoor living space. Our custom stonework and hardscaping services can introduce boarders, retaining walls, patios, walkways and so much more to your landscape.